Cover Love at Romance Lives Forever is a short intro to a book and includes only a cover, blurb, buy links, and social media contacts for the author. 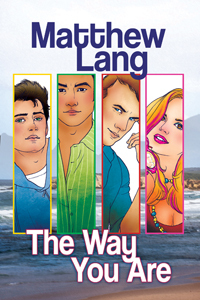 Today's featured book is The Way You Are, by Matthew Lang. Leon, a shy, self-effacing business student at the University of Newcastle, starts to visit coma patient Travis ‘Rook’ Rookford, a heterosexual student who gets gay bashed by a group of bogans. At the hospital, he meets, falls in love with, and has a lover's tiff with hunky male nurse Warrick, in that order. Then, when Rook finally wakes up, Leon is surprised to find Rook convinced that he and Leon are dating. In the midst of dealing with loving a man in conservative regional Australia, Rook’s upcoming court appearance and his own studies, Leon has to come to terms with what he wants, and gets to find out whether every gay man’s dream of having a hot straight guy fall for you is everything it’s cracked up to be. And he hasn’t even started Christmas shopping yet.